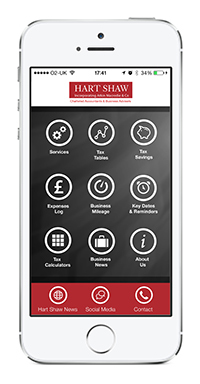 At Hart Shaw we understand that running a business can be time consuming, so we have developed a Mobile App to help you stay on top of key financial announcements and relevant tax changes 24/7. The free ‘Hart Shaw’ App provides expert insight and advice, as well as updates on breaking news anytime, anywhere. Business mileage calculator: Instantly track and calculate business mileage using the in-built mileage tracker. Expenses log: Accurately log and categorise business expenses which can be reviewed and exported at any time for personal use; or email them to us to incorporate into your accounts. Tax calculators: VAT and financial calculators available 24/7 - from simple VAT calculators to more complex ones, such as salary versus, dividend or company car benefits. Tax saving tips: Instant access to tax saving tips including fuel benefit, company car planning, R&D tax relief, capital losses and tax relief. Key dates and reminders: Set reminders and log key dates quickly and efficiently - such as filing dates for tax returns, payments to employees, payments to HMRC and VAT returns - in addition to personal reminders. Business news: Instant access to the latest business and personal accountancy facts, key dates and tax updates. Social media links – Connect with Hart Shaw via Twitter, LinkedIn and Facebook and keep up to date with our latest events and business seminars. Download our app for FREE by scanning the below QR code on your mobile device - or follow the Apple and Android device logos to download our app from the relevant app store. Enjoy the Hart Shaw app with our compliments!